The performance on April 26th is free for Williston Families. A zany rich-boy-meets-hometown-girl romantic comedy, CRAZY FOR YOU tells the story of young New York banker Bobby Child, who is sent to Deadrock, Nevada, to foreclose on a rundown theatre. In Deadrock, Bobby falls for spunky Polly Baker, the theater owner’s daughter. But Polly takes an instant dislike to the city slicker, so Bobby vows – through cunning, razzmatazz, and a hilarious case of mistaken identity – to win Polly’s heart and save the theatre. Memorable Gershwin tunes from the score include “I Got Rhythm,” “They Can’t Take That Away from Me,” “Embraceable You,” “Nice Work if You Can Get It,” and “Someone to Watch Over Me.” Originally produced on Broadway in 1992, CRAZY FOR YOU won the Tony Award for Best Musical and Best Choreography putting Susan Strohman, of THE PRODUCERS fame, on the map. 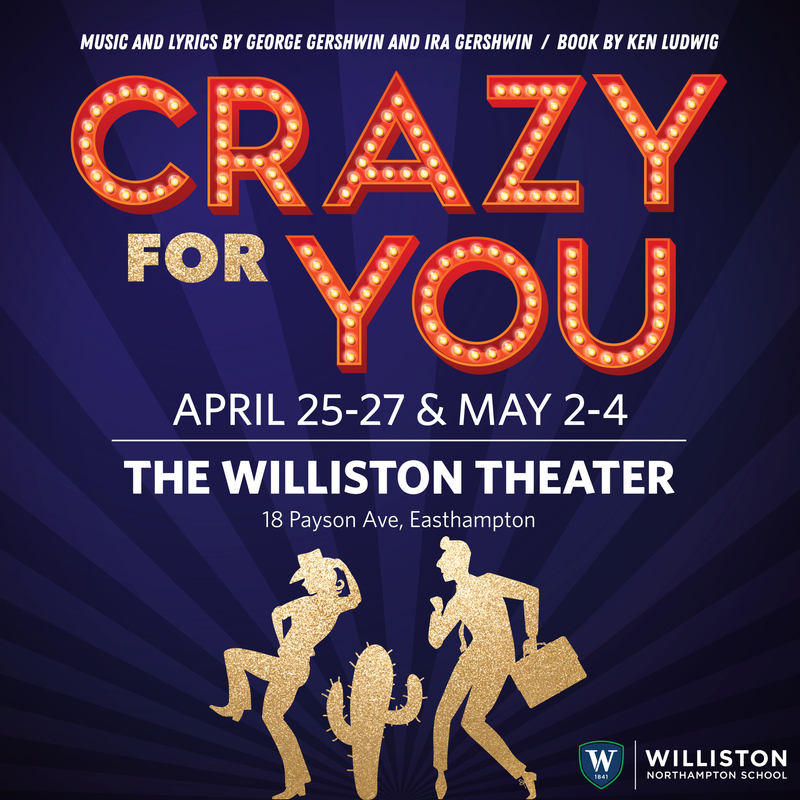 CRAZY FOR YOU runs two hours fifteen minutes including intermission. We do not allow food or drink in the theater, but we encourge you to enjoy your snacks in our lobby. There is no photography or recording of any kind during our productions.